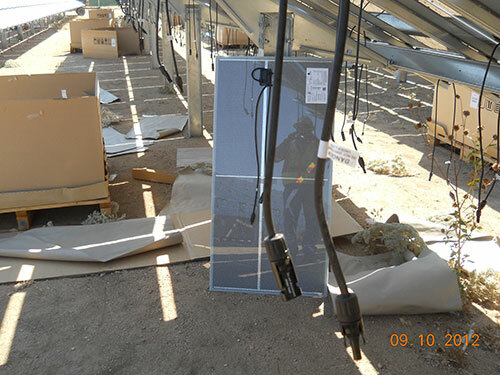 If you have read my November/December 2016 article in IAEI Magazine regarding the hard lessons learned by some of the large solar contractors, you know that installation mistakes at these large sites can develop into major problems and/or lead to unscheduled events. And, some may impact the surrounding communities. Photo 1A. Uncontrolled dust migrating off a large PV site. Photo 1B. Dust migrating off the site creates limited sight distance for drivers. The speed limit along this highway is 55 MPH. 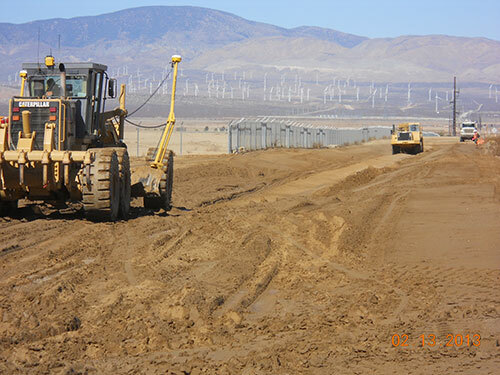 Dust control is an important part of any large project, and at some solar farms, it can get out of control. 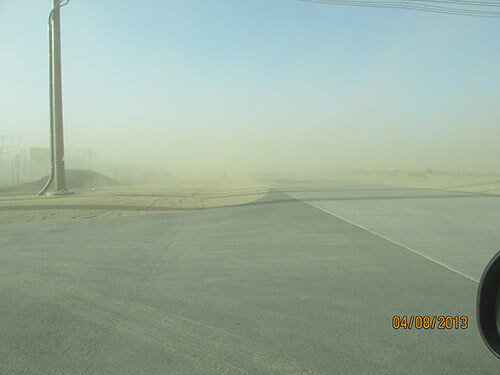 What usually occurs is a complaint is called in to the local County Board of Supervisors, Mayor’s Office, or City Council regarding uncontrolled dust migrating off of a construction site (see photo 1A). 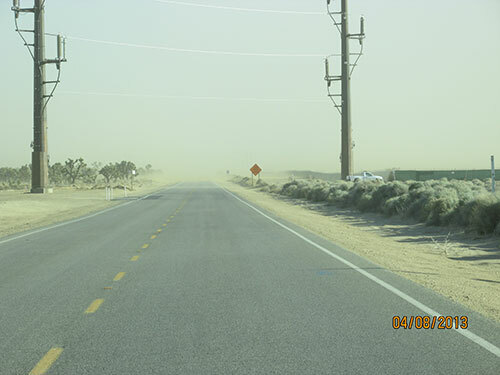 Dust migration can create serious problems, including traffic visibility issues (see photo 1B), and increased risk of Valley Fever contagion, not to mention the impacts to neighboring housing developments. At one project, the contractor removed all of the vegetation to a level below the roots in order to have a flat surface to install their array. They were unable to maintain control of the soil during high wind events. 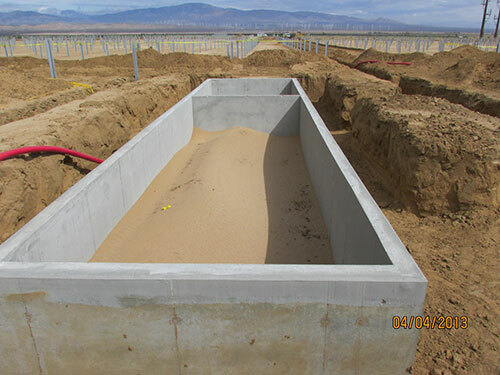 So much soil moved, it actually filled up some of the electrical vaults (see photo 2A & 2B). Photo 2A. Impressive amount of sand that migrated from this project. Photo 2B. 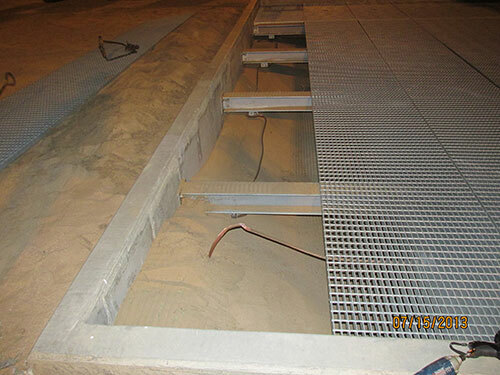 Because the contractor did not plan to control the sand and dust, they spent several weeks remediating the vaults in order to install the medium voltage cables. Upon remediation, the 1.5 MW PV shelter (to the immediate right) was installed on top of this vault. But that wasn’t possible on the day of this photo. Photo 3A. 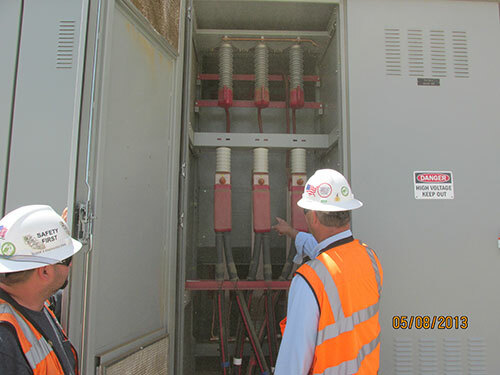 Substation is red tagged and red danger tape is installed by the operators. 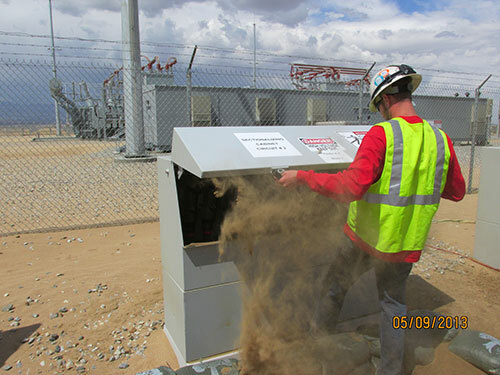 Migrating dust/soil can have serious effects to certain areas, such as the substation walking surface. 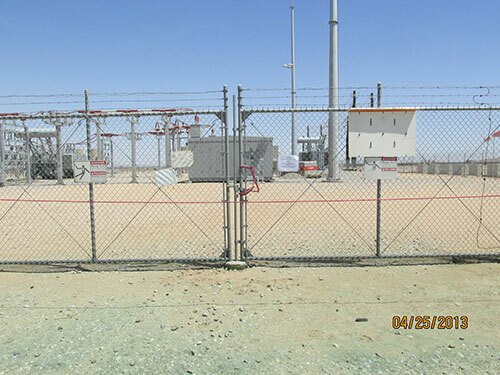 At one project, I wrote a correction notice indicating the substation rock had been compromised by the introduction (migration) of soil into the areas of rock installed for step and touch potential. 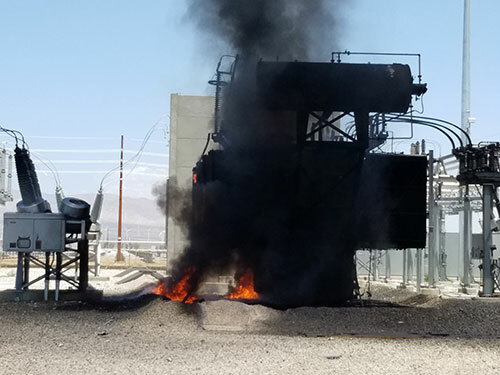 Since the substation was partially energized during construction, the gate to the substation was locked until an assessment and reclassification of Hazard Risk Category for clothing could be determined. It was surprising when the contractor’s engineering team conducted their review and stated that there was no safety issue and that the rock was really not needed. Luckily, the owner (buyer of the project) had a third-party consultant (a highly knowledgeable power engineer) who agreed with my findings and required all the rock and containments to be remediated (see photos 3A, 3B, 3C, 3D & 3E). Photo 3B. 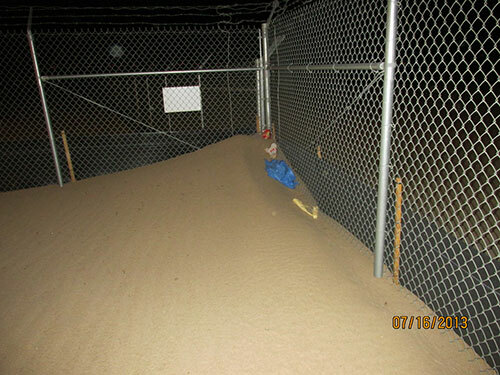 This photo was taken during a substation shutdown before remediation. The fence is 8 feet high. Photo 3C. The containments around the transformers were completely full after only a few months. If there had been an unscheduled event, these containments would not be able to perform their function, which is to contain fluids. Photo 3D. 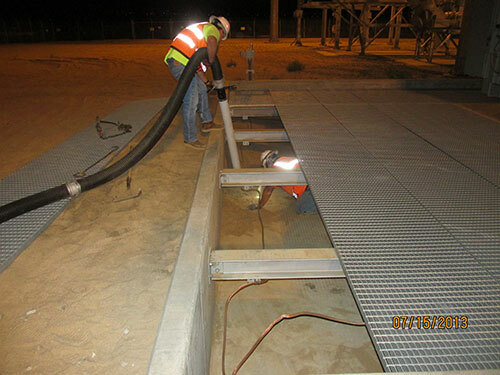 Using a vacuum-truck to remove the sand that migrated from a 50 MW portion of the site. Photo 3E. Remediation is not easy, but proper planning is. 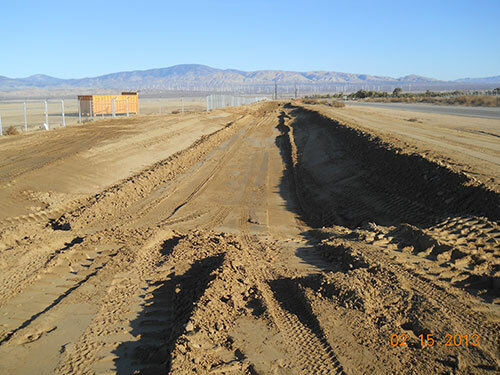 Lack of proper dust control at these sites will result in necessary maintenance before the equipment goes online and could require additional shutdowns that are preventable by using proper construction techniques (see photos 4A, 4B & 4C). At one project, we spent several nights going back through equipment to remove sand and dust that had accumulated in a very short time. Remember, poor grading techniques in construction can lead to several years of uncontrolled dust events because natural vegetation that holds the soil in place was removed during the original construction. The lesson here is to build arrays and roadways with minimal soil disturbance. Photo 4A. Operators identifying major amounts of sand & dust that have migrated into the 35 kV breaker cubicles. Photo 4B. 35 kV rack out breakers are directly on the other side of this enclosure. I wiped off the earth ground symbol. Another issue at these large-scale projects is uncontrolled trash. 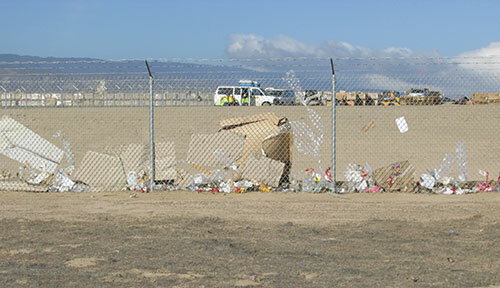 Usually, the contractor does not anticipate the amount of trash created by packing materials such as cardboard, and plastic used to ship materials to the site, as well as food/drink litter left on the site by construction personnel. This is usually not only a violation of the conditional use permit (poor housekeeping), but it is an issue affecting local wildlife. Remember, most of these sites will have endangered protected species and uncontrolled trash will affect their habitats. At one project, the contractor was in such a hurry to install modules to show progress that they did not plan for collection and disposal of trash (see photos 5A, 5B, 5C, & 5D). This caused the issuance of a stop work order and cancellation of all inspections until the issue was resolved. I observed 50+ laborers working over several days to remediate the issue with full size trash trucks arriving hourly. All local hardware stores had their shelves stripped of all trash bags. I had heard complaints from the contractor’s own site safety staff regarding the trash, but those warnings seemed to land on deaf ears of the contractor’s upper management. And, if staff complained too loudly, they would be replaced with a more cooperative site safety manager. This has actually been seen in the field. Photo 5A. The installing contractor’s contract to install modules did not include a requirement to pick up the trash developed by the installation. Photo 5B. Remember, this trash was spread across several square miles and left for weeks. Photo 5C. The wind would literally blow the box tops up in the air and off site. Photo 5D. When a project looks like this, you can be assured the quality of work also suffers. One thing to be aware of on the flip side of this issue is that an inspector’s corrections/stop work orders can make you a target. One common method used to remove an inspector from a site is to fire back with violations of site safety rules. At one (tax payer funded) project, the site safety manager purchased a hand-held radar gun to catch me exceeding the 10.5 mph speed limit imposed at the site. Their hope was that I’d be replaced with an inspector who would not hold them to the codes and standards. I recall being pulled over by a golf cart with a flashing light, and I couldn’t help but ask if tax payer dollars had really been used to purchase a radar gun. It seems a more prudent choice to use resources to prevent trash issues, instead of using resources to try to get around the rules. Other methods to try to have an inspector removed include having site staff write up false statements for submission to the building department. This actually happened, so it is recommended that you keep your management aware of all such confrontations, and keep very detailed documentation, including photos, in order to be able to state your case. Photo 6A. Grading over an existing 230 kV duct bank. This is kind of an interesting situation I was involved in regarding a 230kV underground duct bank at a 230kV substation. The contractor was attempting to redesign the retention basins for erosion control. 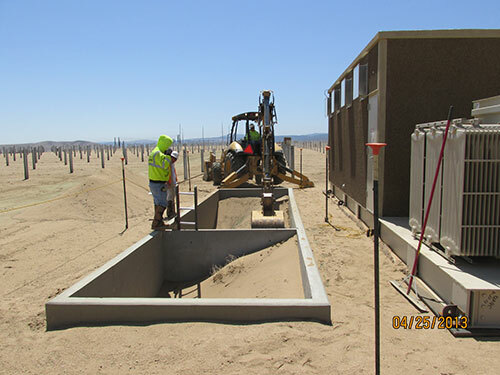 Because the site was graded towards the substation, runoff was eroding portions of the substation fencing and creating additional work after every rain event. The Engineer of Record (EOR) came up with a design that placed a new retention basin directly over an existing 230kV underground duct bank that was leaving the substation, in an effort to control erosion. I remember voicing my concerns regarding the depth requirements and the proposed location for this new basin. However, this too fell on deaf ears and yes, the grading operator hit the duct bank. Luckily, the operator stopped when the blade hit solid concrete or there would have been major re-work and repairs required (see photos 6A, 6B & 6C). The lesson for everyone involved is to plan your work, seek input from all interested parties and implement an achievable goal. Photo 6B. Grading operator pulled off of the job. Photo 6C. That’s my shovel in the foreground. I found the sign under a few inches of dirt. This sign is resting on the concrete duct bank. Fire access roadways (FAR) at these large-scale sites are an important part of the design for safety. Emergency vehicles may need to drive on these roads during an event or to implement a rescue. And most of these vehicles are extremely heavy with a large turning radius. Not anticipating the needs of first responders could significantly lengthen response times and/or prevent access. All departments have their own requirements, however compaction requirements (usually found in the geotechnical report) will require at least 90% compaction. Most access roads will need to be 20-feet-wide with possible 40 foot turning radius clear to the sky. The term “clear to the sky” is important for designers to account for in their plans due to the possibility of module support structure projecting into the road. The mistake often seen during plan review is that the designer will submit a structural drawing showing the required width from driven pile to driven pile. However, the drawing will not show the three to six-foot module overhang that impedes into the required access roadway. Or, the drawing will not show the electrical combiners/tracker controllers installed in the roadway (see photos 7A, 7B & 7C). Again, full disclosure and proper document preparation and submittal are extremely important in the plan check process. Plan-checkers and inspectors are very smart folks, but we can’t read minds. Photo 7A. Fire access road required to be a minimum of 20 feet, clear to the sky. Photo 7B. Oops! The access is less than 17 feet. Photo 7C. Demonstrating how to properly measure fire access roads. In this case, you measure the tracker in the stowed position. 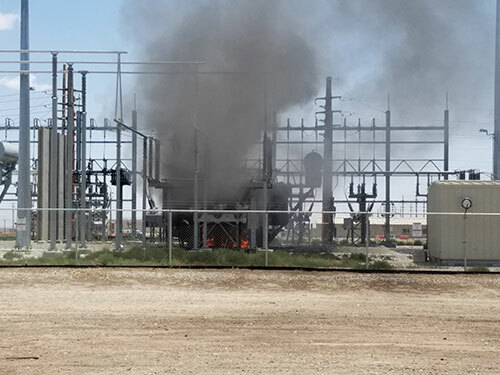 Back in May 2016, while visiting several PV sites, I was driving along and came upon a transformer burning (see photos 8A, 8B, 8C & 8D). The site manager was observing the event with a pair of binoculars. The event had expelled baseball to soccer ball sized shrapnel, which was scattered throughout the substation. Smaller golf ball size material was thrown several hundred feet beyond the substation fence. I was a little surprised at what I was witnessing because I had seen this substation go online only a year earlier. The installation was in a neighboring jurisdiction with a common collection system. 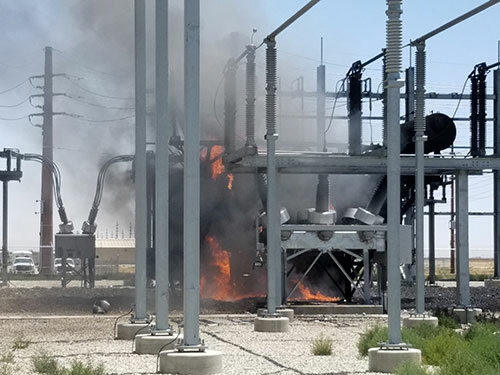 What the manager told me was that at around 11 a.m. the prior day, the operator had just finished his walk inside the substation yard when the event occurred without warning. He also disclosed that they were having problems with the HV bushings. Later on, in 2017, I ran into one of the operators on duty that day, and he indicated the deficiency was improper manufacturing of several HV bushings. Remember, these bushings are not listed/certified to include the remainder of the 230kV transformer. Moreover, I already knew the local AHJ did not require third-party evaluation by an NRTL, which might have identified this deficiency and avoided this event. As you can imagine, this event caused major rework, lost revenue and more importantly, it could have resulted in loss of life. Those operators were lucky. The event burned for several days. This just shows the importance of utilizing and requiring qualified third-party reviewers just like the IBC requirements for special inspectors. 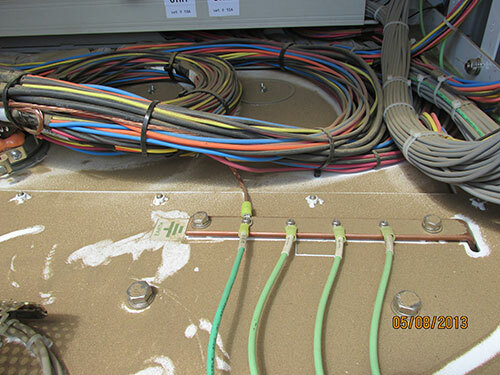 Remember, you can have a perfect electrical installation (verified by qualified electrical inspectors), but if the foundation and structural elements that support the electrical system are deficient and/or do not meet the minimum requirements of the IBC, this could be a recipe for a structural failure that could have been avoided. The result could be a serious injury or death. Photo 8B. The owner elected to let the fire burn. The fire department stopped by after the event, followed by the Air Quality Management Board. Photo 8C. The three insulators are absent from the 230V SF-6 breaker to the left. The blast wall in the foreground saved the adjacent transformer. Photo 8D. 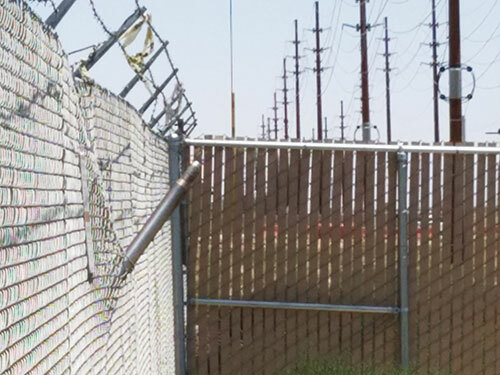 Parts and pieces were found penetrating the substation fence. Marshall Westfall, a special inspector with over 15 years of experience, has a unique perspective due to the wide range of projects he has worked on over the years. Please see his comments below. 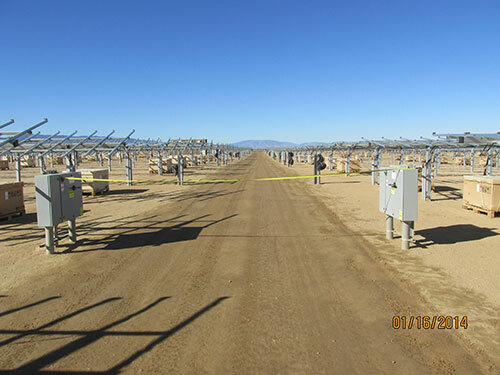 My company has provided special inspection and materials testing services on several utility-scale PV power plants over the past several years. Special inspectors are required by Chapter 17 of the California Building Code (CBC) to observe the construction of specific structural elements. Specific to PV projects, the two most common categories include reinforced concrete and structural steel. 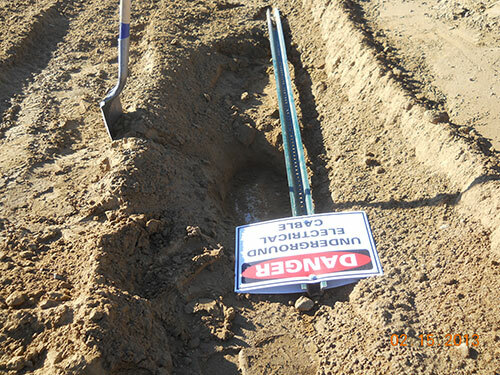 Special inspection does not include soils inspection. Large or small, every project comes with its own set of challenges and learning experiences. Factors such as proprietary design and jurisdictional building code requirements make each project unique. The following is a discussion of the more common special inspection and testing duties that are often required on these projects, as deemed necessary by Chapter 17 of the CBC, the AHJ, and/or the engineer of record (EOR). Though special inspection and materials testing typically represent a small percentage of the overall budget, these activities can have a huge impact on the schedule when non-conformances are identified. That is why, in my experience, project managers who budgeted adequate time and resources to the inspection and testing requirements were successful in avoiding delays and unnecessary costs. At its most basic, the role of a special inspector is to observe and report the progress of the project. Daily field reports and material test reports convey those observations to all interested parties. Unresolved non-conforming items are to be reviewed and addressed by the EOR and the AHJ. The special inspector has no authority to direct or design work. Material ID can take place on the jobsite or in a fabrication shop. While performing material ID, the goal of the special inspector is to establish traceability through review of the materials’ mill certifications, batch tickets, and/or material test reports (MTR). Material ID is required on structural components such as structural steel, high-strength bolts, reinforcing steel, concrete embeds, and concrete materials. These documents define the material’s origin, size, strength, grade, mix design, and ASTM designations (among other things). In many jurisdictions, if the documentation matches the materials, then those materials are acceptable to use. However, some jurisdictions require additional third-party materials testing. 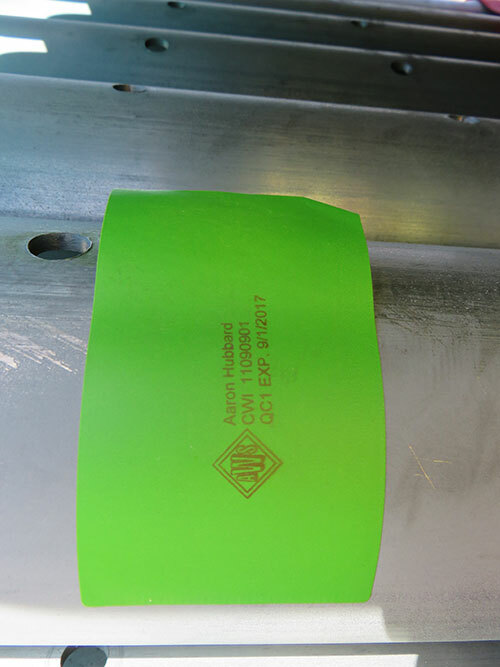 Additionally, if material has lost its traceability, or was placed/erected/assembled without special inspection, or is otherwise unidentifiable, the EOR and/or the AHJ may either reject the material or require third-party materials testing to confirm conformance. Materials testing is done to confirm whether or not the materials perform within their designed limits, as determined by their ASTM designation or mix design. Materials can be tested by destructive or non-destructive means. Some tests occur in the field (such as ultrasonic testing of welds), but most tests occur in a laboratory. Structural materials that commonly require testing on PV projects include structural steel, structural welds, high-strength fasteners, concrete reinforcement, concrete, and post-installed anchors. 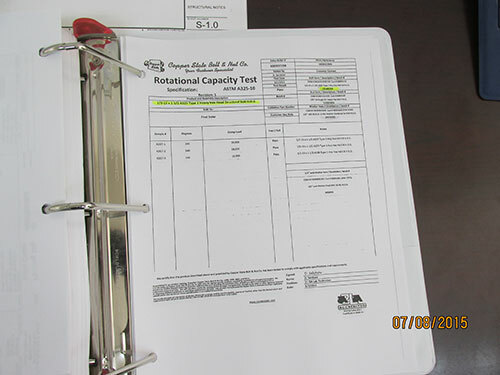 Material test reports are distributed to all interested parties. 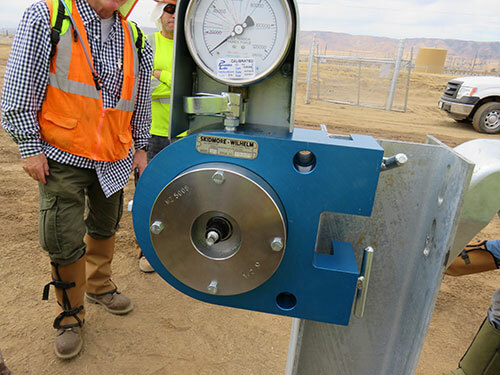 Non-conforming materials (or materials that fail) are to be quarantined from use while the EOR and AHJ determine if they are suitable for use on the project. The frequency of testing, sample size, number of samples, and the types of tests are determined by the code/specification, EOR, and/or the AHJ. Additional testing, beyond what is required, is sometimes requested by project management for QA/QC purposes. In special circumstances, it is important that the inspector follows a written procedure from the EOR (approved by the AHJ) describing the testing requirements. Photo 9A. All W6x9 piles have appropriate identification. Photo 9B. Special inspector verifies materials arriving at the job site. ASTM-A-6 requires rolled steel plates, shapes, sheet piling, and bars to be identified by heat number, size of section, length and mill ID. This is no different than any permitted project with structural steel. Photo 9C. Fabricated materials arrive at the site. Photo 9D. 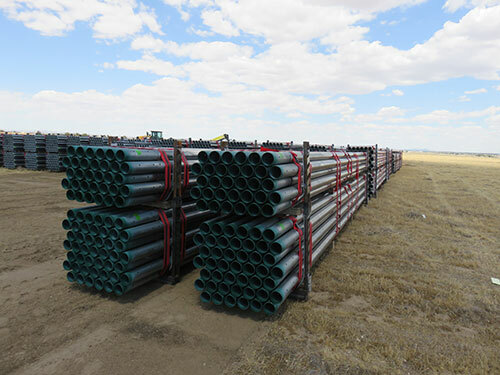 Each bundle was labeled at the site of manufacture to establish traceability to the site. In this case, the special inspector applied his mark and was present during shipment arrival to verify compliance to the CBC. Photo 9E. Special inspectors using a skidmore to verify the clamping force of a Huck fastener used in place of an A-325. Additional testing was required. Special inspection is required in the field during the construction, assembly, and erection of the structural elements of the arrays. It may also be required within fabrication shops if the AHJ deems it necessary. The most common example of when shop inspections are required is when the shop does not meet the minimum internal QA/QC requirements of the building department, and third-party observation is deemed necessary. Mechanical and electrical elements are inspected by the AHJ and/or certified by third-party. Soils inspections are usually handled by a geotechnical firm. 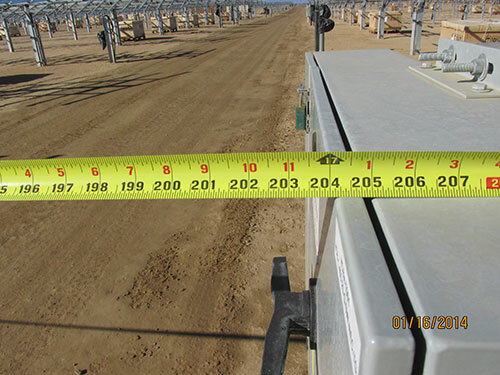 On a typical ground-mount PV project, special inspections are completed for cast-in-place or precast reinforced concrete, concrete sampling, structural steel welding & high-strength bolting, and post-installed anchor installation. Non-destructive testing of welds, such as ultrasonic, magnetic particle, or dye-penetrant testing, may be required as well. 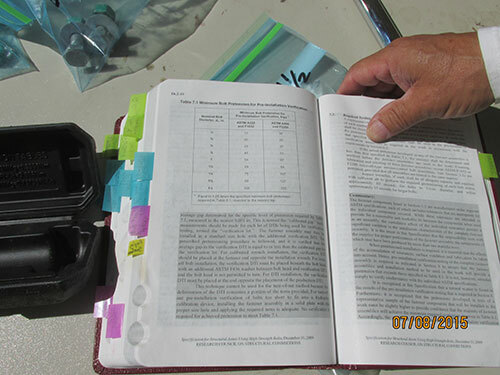 Material ID, as described above, is an ongoing task for the special inspector. It is his/her responsibility to monitor and record the arrival of all new material (be it in the field or the shop) and verify its conformance to the project documents before it is used in production. All material documentation and test reports should be organized and maintained by the inspector. The proper storage and handling of materials and test specimens must also be observed. For structural welding and high-strength bolting, the special inspector must verify tool calibration records and welding equipment prior to their use in the shop or the field. The use of proprietary fasteners and fastening equipment may require prior approval from the AHJ. Welding procedure specifications (WPS), procedure qualification records (PQR), and welder certifications are confirmed by the special inspector before any welding operation begins. Only after this has all been done is the special inspector able to observe the assembly of the structural elements of the array. 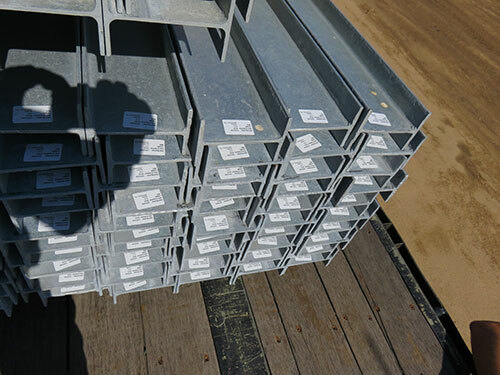 During assembly, the inspector will verify several criteria of the welded or bolted connections to ensure that they conform to the building code, specifications, and project documents. Photo 9F. 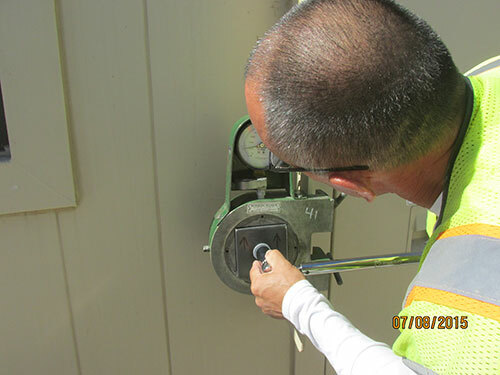 Special inspector is verifying appropriate values (Kips) for Pre-Installation Verification. Notice all the homemade tabs identifying sections of the AISC Manual. This is the special inspector’s bible. Without this reference in the field, the inspector cannot perform his or her job. Look for it next time you’re out at any large steel construction project. Photo 9G. Special inspector is setting up the skidmore for pre-installation verification to confirm suitability of the complete fastener assembly and confirm the procedure/proper use for the bolting crew of the pretention method to be used. Photo 9H. All documentation for high-strength steel, bolts, nuts, washers, and galvanization are kept in binders. In this example, since this was a galvanized A-325 bolt, F436 washer and a lubricated nut (A563), the assembly shall conform to the rotational capacity testing required by ASTM-A325-10. Look for this and other documentation. The reinforced concrete special inspector will verify that the correct size and grade of rebar is properly placed, per code and project documents, prior to concrete placement. 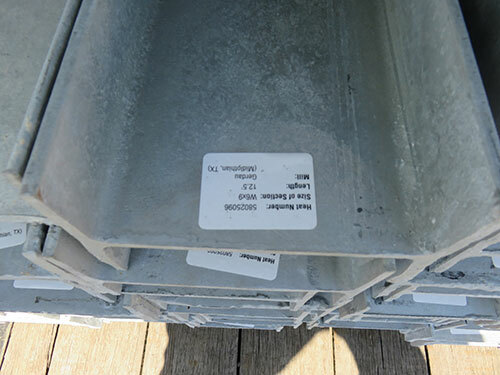 If the rebar is unidentifiable or is not delivered with proper documentation, it will either require third-party testing or may be rejected by the AHJ altogether. After the rebar placement has been approved by the special inspector and the AHJ, concrete can be placed. The special inspector verifies that each delivery arrives with the approved mix design and that the concrete is in an acceptable condition prior to discharge. At regular intervals, as required by code or project documents, the concrete is sampled for quality and strength. 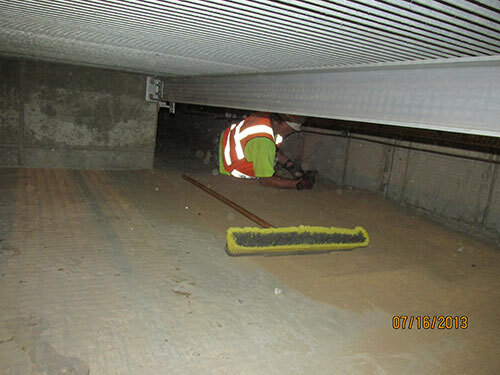 At any point during these inspections, non-conforming issues that are not corrected are escalated to project management, the design team, and the AHJ for review. 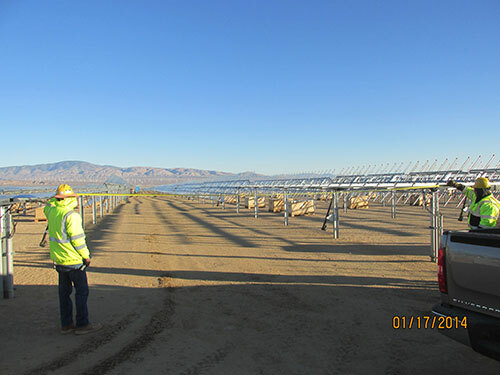 PV projects tend to follow aggressive schedules, which demand a large workforce. A large workforce requires a large inspector presence. The sheer scale and pace of PV projects can be overwhelming to special inspection firms who are not prepared to staff them adequately. Underestimating the number of inspectors either compromises the production schedule or the quality of the output; something has to give. As more Building Departments become savvy to the special inspection requirements of PV power plants, the need for experienced inspectors will grow. As Marshall is saying above, the need for experienced special inspectors is growing. And keep in mind, many of these deficiencies that were written about in these articles were found after the contractors’ QA/QC completed their own inspections. This magnifies the need for jurisdictional inspectors to be on top of their game. So, make sure to pursue educational opportunities, go out and get your certification, and make yourself the highest caliber inspector that jurisdictions and companies are looking for. And mentor the younger generation, encourage their entry into the industry — and take the inexperienced inspectors under your wing. Show them and teach them what you know. Over 20 years ago, someone did the same for me, and I am grateful to have been set on this path. 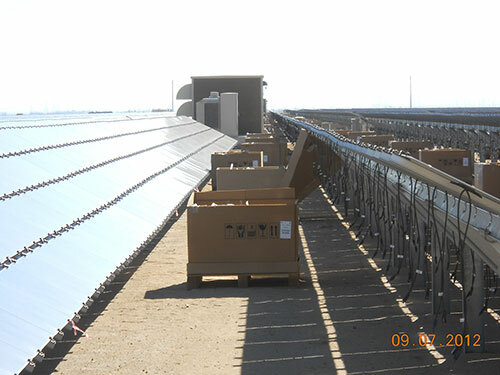 I never would have guessed all those years ago that I would have the opportunity to be part of these large PV projects. Who knows where your path can take you in 10-20 years. Think about it. Marshall Westfall is the President of Advanced Special Inspection, Inc. ASI provides inspection and testing services to private and public projects throughout California.